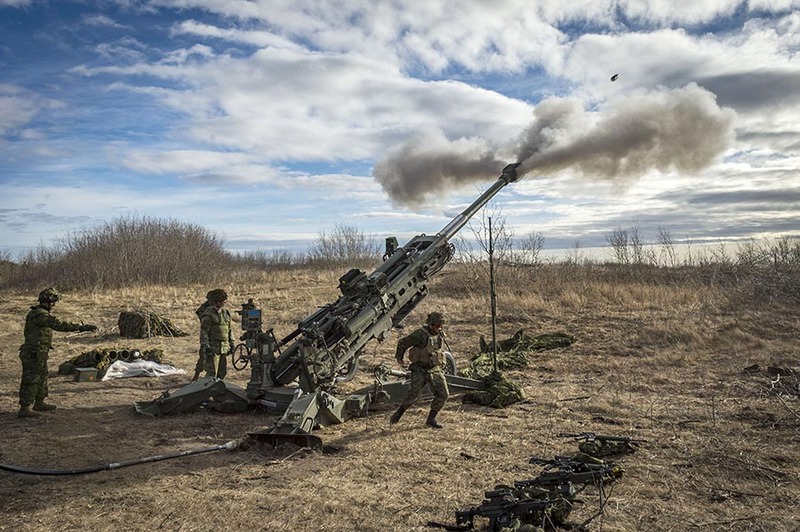 Members of 1st Regiment, Royal Canadian Horse Artillery – a unit within 1 Canadian Mechanized Brigade Group – fire the M777 Howitzer during a live-fire mission on Exercise IRON RAM 17 at Canadian Forces Base/Area Support Unit Wainwright’s Training Area on October 24, 2017. Photo: Corporal Jay Ekin, Wainwright Garrison Imaging. ©2017 DND/MDN Canada. It’s going to be a busy and exciting time around western Canada over the next several months as the Canadian Army’s 1 Canadian Mechanized Brigade Group (1 CMBG), a Regular Force formation, makes its way along the Road to High Readiness. What is the Road to High Readiness? The Road to High Readiness is the second stage of a continuous three-year cycle that sees Canadian military personnel prepare to be deployed on operations abroad and within Canada. For 1 CMBG, it runs from July 1, 2018 until June 30, 2019. While 1 CMBG progresses along the road, its counterparts at 5 Canadian Mechanized Brigade Group in Valcartier, Quebec are currently at High Readiness and deployed on missions around the world. Meanwhile, 2 Canadian Mechanized Brigade Group in Petawawa, Ontario is in the support phase, having been stood down from its deployments at the end of June, 2018. In order to achieve that end, Col Ritchie explained, the training process has been designed to follow the military objectives laid out by the government, while also seeking to provide balance for the soldiers. The first part of the training will be decentralized, he said. The eight units in the brigade will do their own unit-level training, following the brigade’s overall objectives. This training regimen is scheduled to run until March 30, 2019. Starting in April 2019, training will shift to a full brigade format at Canadian Forces Base/Area Support Unit Wainwright in Alberta. There, 4,500-plus soldiers will train in live and simulated scenarios, by day and by night, to be prepared for almost any situation. This second stage of the training will culminate at the end of April when it transitions into the Army-directed Exercise MAPLE RESOLVE. “Ex MAPLE RESOLVE is the platform exercise for the Canadian Army,” Col Ritchie said. It is not a live-fire exercise, but it provides an excellent chance to test the training regimen the soldiers would have just completed. And if not, the lessons learned on this authentic training environment can be used to adapt the training to become more effective, he added. Upon the completion of Ex MAPLE RESOLVE, 1 CMBG will be reconfigured into task forces, which are assembled and deployed to different theatres of operation around the world, Col Ritchie said. Those deployments would begin on or shortly after July 1, 2019, as 1 CMBG moves off the Road to High Readiness and into the High Readiness state itself. “That’s when the elements that just finished spending a year training will either deploy to a specific mission on a named operation, or they will remain at High Readiness waiting for the government of Canada to provide new contingencies, and we would be prepared to go and deploy on those,” Col Ritchie said. All that said, just because 1 CMBG is on the Road to High Readiness for a year doesn’t mean it will disregard its duties and responsibilities domestically. “We have a standing mandate to provide support to Canadians in need when directed by the federal government,” Col Ritchie said. The most vivid example of this is the recent Operation LENTUS 18-05, where soldiers fought forest fires in British Columbia in the summer of 2018. Through all of this, the soldiers and command teams work from a single, overarching philosophy.